What is corflute? Corflute signs are sturdy signs that are perfect to promote many businesses and services. Here are 7 benefits of using corflute signs. Signage is one of the most important factors in getting your business noticed. A study from FedEx found that over 75% of consumers entered a business for the first time based on its signs alone, and more than 50% of the survey respondents indicated that poor signage discouraged them from visiting a business. A sign is no longer a simple slab of wood with some paint. There are more options for signage than ever, from custom teardrop flags to pull up banners. The options can be overwhelming. Corflute is another of those options. What is corflute? Excellent question! Its unfamiliar name can pose an obstacle to making use of this versatile and durable material. Don’t make this mistake. Allow us to enlighten you to the benefits of using corflute signs for your business. Keep reading to find out just how effective this lesser known material is. Let us start with the basics of just what corflute is in the first place. Odds are good that you have already seen corflute out in the world. It is a plastic that resembles corrugated cardboard. Some manufacturers refer to it as corrugated plastic. Just like corrugated cardboard, corflute has a uniformly ribbed surface. It comes in varying thicknesses, including 3mm, 5mm, and 8mm. Corflute is a fairly rigid material when set in place, but it is also bendable, which makes it useful in situations that require three-dimensional signage. Corflute’s unique properties give it quite a few benefits in the world of signage. It is more lightweight than traditional outdoor signs, but it is more heavy duty than similarly bendable signs. Thus, it fits more purposes than other sign materials. We will cover all of these benefits and more in our rundown of reasons to use corflute. Read on to keep exploring. “We will save money” is one of the best reasons to use any sign material, and cost-effectiveness is one of corflute’s biggest strengths. Corflute is often used for temporary signage. For example, used car lots often make use of corflute when advertising sales. Businesses would not use corflute in these situations if it were too expensive for temporary use. When you have a one-time event to advertise, the relative inexpensiveness of corflute makes it quite an attractive option. People use corflute often for outdoor signage because it stands up well to the elements. Corflute is waterproof, so your sign will not expire after a day in the rain the way it might if it were made of a lower quality material. Water rolls off of corflute, and since it is plastic, there is not even a prolonged drying process. Corflute is also a lightweight material, which makes its durability that much more impressive. Signs made of other tough materials require a gym regimen to carry them out of and back into storage. Corflute combines durability with portability. One condition in which corflute’s durability gets tested is extremely windy conditions. Like its cardboard cousin, corflute’s bendable nature makes it susceptible to warping from the wind. If the conditions in which you need a sign are especially windy, you may want to consider another material. Thanks to its aforementioned lightweight quality, corflute is easy to install. Anyone can install it almost anywhere. It is even easy to take down again. All you need to attach your corflute sign to a flat surface is glue, screws, nails, or adhesive tape. If you want to attach corflute to a fence, you can do so through the metal eyelets in the corners of most corflute signs. These eyelets also allow you to attach corflute signs together in three-dimensional patterns. What do we mean by three-dimensional patterns? We are not just talking about traditional cubes and spheres, that is for sure. We are mostly referring to a classic corflute shape, the Toblerone, or triangular prism if you prefer. You can use three corflute signs attached together through the eyelets to form this eye-catching shape. All you need are some plastic ties. The much-beloved Toblerone shape is especially handy in conditions without wind where you need a freestanding sign. This three-sided sign can lie horizontal or stand up vertically, depending on what best fits your needs. We have already seen how corflute signs can be customised to create shapes, but the shapes of the signs themselves are also easily customisable. Manufacturers can cut corflute into any shape or size you require, which means the material is literally an excellent fit for non-traditional spaces. There are no restrictions on colour when it comes to corflute. It shows dark colours as well as it does bright colours. This gives corflute an edge over materials that can technically come in any colour but are much more effective in specific shades. Corflute’s palette is as endless as your imagination. Corflute accommodates high-resolution digital printing right onto the material, which means your sign does not have to go through any middleman medium to transfer from printer to sign. Perhaps the only quality that beats cost is speed, and corflute has speed in spades. Corflute signs are not only inexpensive to manufacture, but printers can turn them around quickly. Corflute is easy to keep in stock. Because of this, printers can often turn around an order for a corflute sign in under 24 hours. Corflute is a lesser known sign material, but it is quite flexible and effective for everything from temporary event signage to life-size cutouts of people for parties. We hope you can better answer the question, “What is corflute?” after this rundown of the material and its benefits, such as versatility, durability, and relatively low cost. 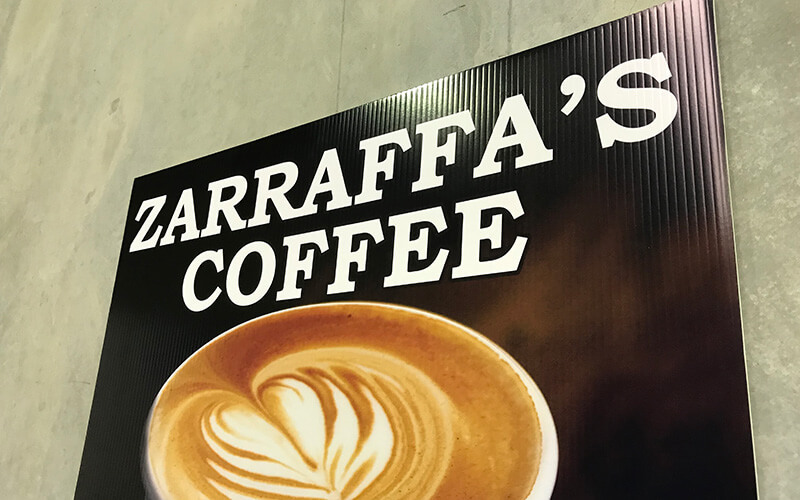 If you are convinced corflute is the right material for your next sign, check out our corflute sign options to get a quote on your corflute sign.